Paige-Moore was understandably devastated when she heard that Moore, who was transgender and paranoid schizophrenic, died in Berkeley Police custody in her home on the night of February 12. How she died is still a mystery. “We understand the community’s concern over this incident, and the desire to have as much information about this incident as possible,” but “a thorough investigation takes time,” said Berkeley Police’s Public Information Officer, Jennifer Coats, via email in late February. 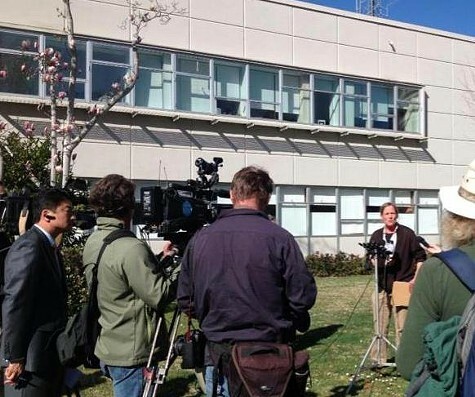 Copwatch's Andrea Pritchett speaks to press in front of the Berkeley Police Department on February 28. It was around 11 p.m. on February 12 when police arrived at Moore’s downtown Berkeley apartment to handle a mental health-related disturbance. This first visit was fairly quiet. When the cops left, Moore was still alive in her home. According to the Oakland Tribune, police "originally were going to take [Moore] to Alta Bates hospital in Berkeley for a psychiatric evaluation, but then they discovered an outstanding warrant for assault from San Francisco." These officers, whose names have not been released, made a fateful decision: to arrest someone who was known by the department to be paranoid schizophrenic, while she was apparently experiencing a psychiatric emergency. When Moore was told she was going to be arrested, she became combative, police told the Tribune. Almost a month after the fact, we don't know much more about that night in February. The coroner's office still hasn't released a cause of death. At a community meeting on February 28, Veena Dubal, a member of the Berkeley Police Review Commission who said she was speaking as a member of the community and not on behalf of the commission, spoke about “a lack of transparency” in how the department has managed the situation. Because it has released so little information, a coalition of local organizations (Berkeley Copwatch, Coalition for a Safe Berkeley, and the Amnesty International chapter at UC Berkeley) is in the process of conducting an investigation of their own. The Bay Area is celebrated for being the one of the world's most accessible place for people with disabilities. But, as Pritchett said, "There's this larger question of how police just kind of get to assassinate, 'put down', terminate mentally ill people. The interaction between the police department and the mental health department in incidents involving people with psychiatric emergencies is really important." In Moore's case, it seems the mental health part of the equation wasn't there. Mental health emergencies "don't always happen during business hours. This episode, if it was an episode, was happening between eleven and midnight. So does that mean if someone's having a [psychiatric emergency] they're not going to get any kind of services from our city, and so we're just going to let police with guns handle it?" Moore’s stepmother and neighbors confirmed that she identified as a woman, although in media reports and Berkeley Police Department press releases and statements about the case, she's referred to as he and him, a marked sign of disrespect to someone who likely had to fight every day to be understood as female. Back in 2001, Berkeley became one of the first cities in the United States to offer transgender sensitivity training to officers, but when something as basic and vital as using the correct language to talk about someone is disregarded, it's a symptom that these trainings have failed. "The effectiveness of the Police Review Commission has decreased, and police responses to situations have become increasingly violent. The situation for people of color, young people, houseless people and those on the margins has steadily deteriorated in recent years. Likewise, our ability to bring issues to the attention of the Police Review Commission and to have cases heard fairly has decreased. New regulations that are completely biased against complainants make it almost impossible to sustain complaints against a police officer. We can expect more tragic incidents of this kind if nothing changes. We believe that an unarmed, obese and schizophrenic woman in her own home should have been responded to by, if anything, mental health professionals, not armed police." While we don't know how Moore died, we do know that uncountable disabled and transgender people suffer and die in police custody. We do know that in Berkeley, as in most cities, the numbers are against them: the City of Berkeley's budget for 2013 appropriates $58.5 million for the police department, while health services is set to receive less than half of that, of which just a fraction goes to mental health services. We also know that reactive responses from police cost more than proactive health services — both in terms of money and lives. Calling Moore by her preferred pronoun is the least we can do. What we also must do is reconsider our ideas around what constitutes public safety, or else our government agencies will continue to be implicated in the mistreatment of people like Kayla Moore. Editor's note: A previous version of this story failed to note that Veena Dubal, a member of the Berkeley Police Review Commission, was speaking as an individual and not on behalf of the commission at the February 28 community meeting. This version has been corrected.